China's senior leadership has just signaled for more stimulus, as its economy and stock market prepares for a possible economic collision in early 2019 from the trade war with the United States. The Communist Party’s Politburo, a group of 25 people who oversee the Communist Party of China headed by President Xi Jinping, finally admitted on Wednesday that there was "growing downward pressure" on the economy with "profound changes" in the economic environment, Xinhua news agency reported. It is the first time the leadership has shown public concern about China's rapidly slowing economy since the trade war began earlier this year. “We have to enhance reform and opening up to focus on core problems with targeted solutions ... We must get our own things done and firmly seek high-quality growth." Officials have already tried a handful accommodative policies, ranging from tax cuts to regulatory support, rather than loading up the ole' fiscal cannon as seen in prior slowdowns. 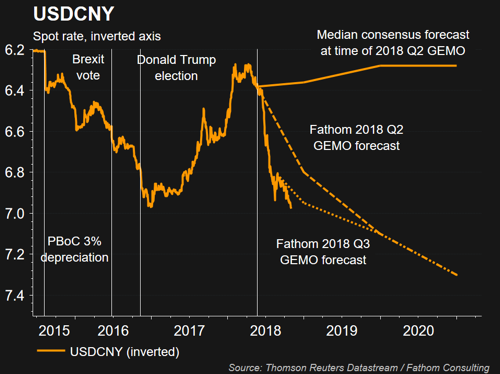 Bloomberg notes that investors seem unpersuaded by the drip-feed approach with the yuan near decade lows and regional stock markets in correction territories to soon bear markets. 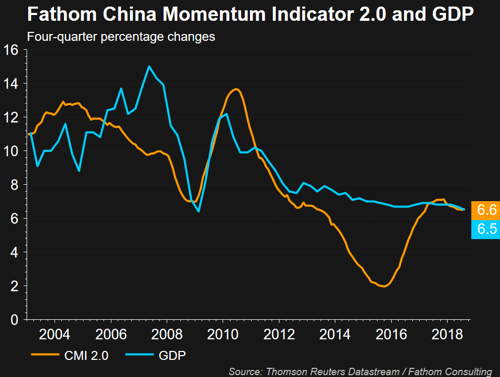 "Accepting slower growth has long been a challenge for Beijing, but now the rate of slowdown is firmly out of the comfort zone," Katrina Ell, an economist at Moody's Analytics in Sydney, told Bloomberg. "In recent years the balancing act has been addressing risks in the financial system against pressure to stabilize economic growth. It appears the latter is again more of a priority." "Manufacturing growth slowed to the lowest level in more than two years, and while economists had seen further tax cuts coming, few had predicted bigger stimulus for now. An export sub-gauge fell deeper into contraction territory, suggesting that an earlier export rush to beat US tariff deadlines will fade sharply. The US is preparing to announce by early December tariffs on all remaining imports from China if talks next month between presidents Donald Trump and Xi Jinping fail to ease the trade war. An increase in the tariffs already in effect on US$200 billion of Chinese imports scheduled for January would provide a stiff test to many exporters and could quicken the shifting of global supply chains," reported Bloomberg. In the overnight session on Tuesday, a series of trade data releases suggested that the global economy was headed for economic turbulence in the coming months. Industrial output for September in South Korea and Japan missed estimates, as did third-quarter output in Taiwan. "The spring of 2019 will be the real difficult time for China as multiple factors such as trade tension, slower sales of durable goods and the end of a property boom in lower-tier cities weigh on growth," Lu Ting, chief China economist at Nomura International Ltd. in Hong Kong, said after the announcement. 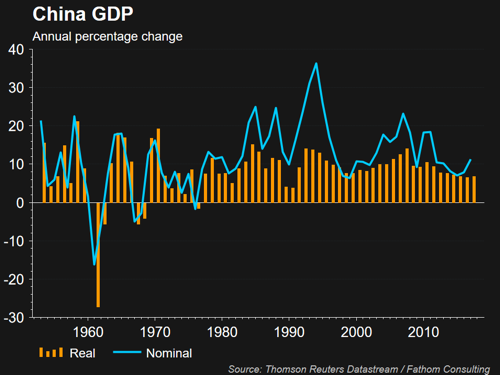 "It'll be a test if China can sustain growth of around 6.5%. 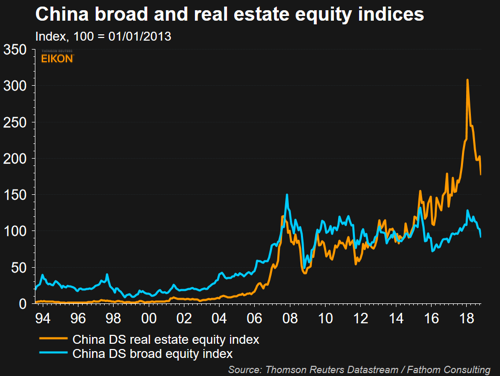 Policymakers are likely to further cut taxes and ease property purchase controls in bigger cities to lift the economy." The government and central bank have introduced several stabilizing measures, adding to steps to boost liquidity in the financial system, tax deductions for households and targeted measures aimed at helping exporter. However, those countercyclical buffers have yet to have much effect. George Magnus, an economist at Oxford University's China Cent, told Bloomberg if the new stimulus measures accelerate China's debt load, then the communist party could face backlash and have unintended consequences so late in the cycle. "It was always the case that the acid test of the government's resolve to deleverage would be its nerve if the economy started to falter," he said. "Which it is." 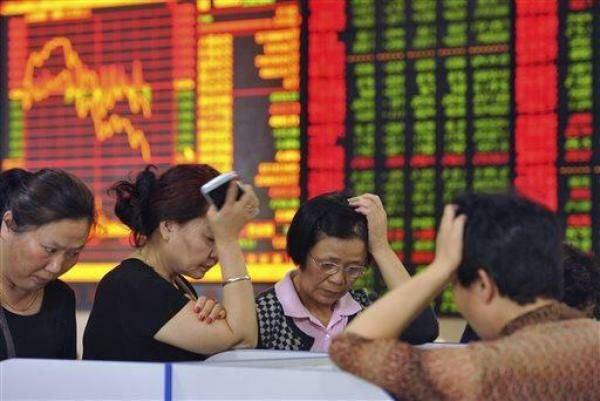 Next year could be rough for China as it now prepares for economic turmoil thanks to the trade war. As for the U.S., the reason is apparent why October was one of the worst selloffs in the stock market in quite some time: Wall Street finally figured out that after all the front-loading Trump's economic miracle, global growth is about to drop off rather abruptly and usher in a possible worldwide recession.